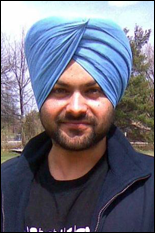 Department of Aerospace Engineering graduate student Harinder Jit Singh was recently awarded the Kalpana Chawla Scholarship from the American Society for Engineers of Indian Origin (ASEIO). The ASEIO scholarship, named in honor of Dr. Kalpana Chawla, the first Indian-born woman in space, is given to an engineering student in space sciences and is awarded based on academic success and research strength. Singh is a doctoral student pursuing research that focuses on the theoretical and experimental study of crash protection systems for helicopters. He is working under the guidance of Department of Aerospace Engineering Chair and Minta Martin Professor of Aerospace Engineering Dr. Norman Wereley. Singh's project, which is supported by the U.S. Naval Air Warfare Center at Patuxtant, Md., aims to minimize the potential for injuries to a helicopter occupant during a crash by utilizing a state of the art adaptive seat suspension system. During a helicopter crash, large stress loads are transmitted to seated occupants that may cause spinal and pelvic injuries. Singh's system promises not only to improve protection levels for occupants, but it is designed to provide better protection for individuals in larger and smaller weight ranges. This new technology could also be employed in armored vehicles that may be exposed to landmine blasts or high-speed boats that undergo repetitive shock during high sea states. When asked about the scholarship, Singh said, "Hard work alone is not enough, a direction is extremely important to be successful. I am honored to receive this scholarship and the credit goes to my advisor, Dr. Norman Wereley, who encouraged me consistently at every level." Singh will be presented with the scholarship award during ASEIO's 28th Annual National Convention that will be held on September 28, 2013 on the University of Maryland College Park campus. For more information on the American Society for Engineers of Indian Origin (ASEIO), visit their website.